Me: Next bottle of wine we open, let’s try the dandelion. The dandelions are starting to bloom now, and I think we should try some of last years before we make another gallon this summer. Alice: We can try it if you want, but I think the dandelion wine was way too much work to make it again. Me: The color is very nice, but not too much of a flavor. Alice: (After one glass,) Whoo, this is pretty strong! Alice: (After her second glass,) I think we should make another gallon of dandelion wine this year. This entry was posted on Tuesday, May 27th, 2014 at 3:33 pm and is filed under Uncategorized. You can follow any responses to this entry through the RSS 2.0 feed. You can leave a response, or trackback from your own site. 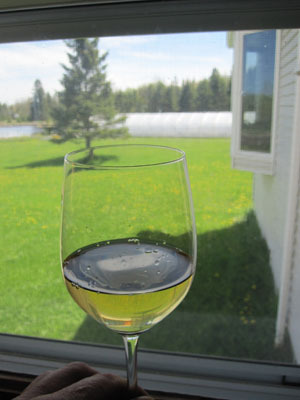 Dandelion wine is excellent. I’ve tried several different recipes over the years and I always say “Not going to make it this year” and then it’s a sunny Saturday and I’m outside picking flowers. I’ve used lemons for acid. Oranges, I used orange juice before. I’ve even used Maple syrup instead of sugar. I swear that tasted like a cheap mead.